Do you like a little nutmeg on top of your coffee drink? Nutmeg is a warming spice made from the inner seed of the nutmeg tree (Myristica fragrans) of Indonesia. The same tree is the source for mace, a spice with a similar (but milder) flavor profile, harvested from a red, stringy substance that surrounds the inner seed. Nutmeg is used in many cultures and cuisines, in both sweet and savory foods. These include German, Greek, and Middle Eastern cuisine. But nutmeg has its dark side as well. The control of nutmeg production and trade has a long and bloody history. Nutmeg is used in many cultures and cuisines, in both sweet and savory foods. These include German, Greek, and Middle Eastern cuisine. Please note that, when taken in large quantities, nutmeg is a toxin. 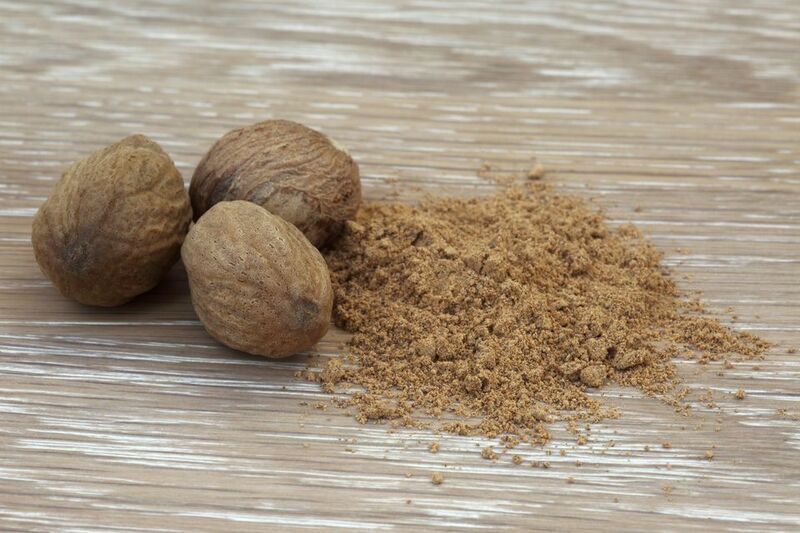 There has been some press over an issue with some teens using nutmeg as a drug. Grated or sprinkled nutmeg can add a dash of eggnog spice to the top of a latte for a seasonal delight. These recipes use nutmeg as well. Cafe con Miel Recipe: This coffee with honey might be served after dinner in Spain. Cinnamon and nutmeg are both brewed in the coffee. Flaming Spanish Coffee Recipe: See how to make this potent drink with nutmeg and cinnamon, complete with pyrotechnics. Nutmeg is sometimes used as a masala chai spice. It's not one of the essential ones, but you can find in in regional variations or custom blends. Nutmeg tends to go best with black teas, particularly black tea lattes. If you want to add a dash of eggnog spice to a tea latte, include some nutmeg. Since it is a warming spice, nutmeg is commonly used in holiday drink recipes, such as eggnog, hot chocolate, and apple cider. Crockpot Mulled Cider Recipe: See how to make this heavily spiced cider in a crockpot, great for serving at a holiday party. You can choose to include rum or brandy, or not. Tahini and Spice Hot Cocoa Recipe: Enjoy your hot chocolate with warming spices of nutmeg and cinnamon, served in a steaming mug with a cinnamon stick to stir it. Cooked Eggnog Recipe: You won't have to worry as much about food safety with this eggnog as the eggs are cooked in a custard before the heavy cream and rum are added. Of course, nutmeg is sprinkled on top. Rum Holiday Eggnog Recipe: This recipe doesn't cook the eggs, so you'll need to enjoy it safely. Vegan Eggnog Recipe: All the flavor without the eggs or dairy products. This vegan eggnog is made with silken tofu and soymilk, with nutmeg on top.